Dr. Tracy Galuski has worked in the field of early childhood education for many years. Serving initially as a toddler teacher, she moved into different roles such as preschool teacher, child care program administrator, training specialist with both the Child Care Resource Network and Success by 6 at the United Way, and finally as a college professor at SUNY Empire State College. Dr. Galuski served for many years on the board for Association for the Education of Young Children of Western New York, the New York State Association for the Education of Young Children, and Directors and Leaders in Western New York. She was awarded the Level 3 Early Learner Training Credential in 2010, and she continues to offer training on a wide variety of topics in the local community. 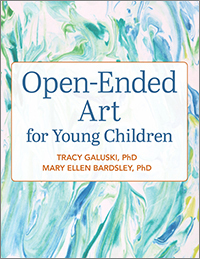 Authors Dr. Tracy Galuski and Dr. Mary Ellen Bardsley present the challenges teachers encounter when faced with best practices and expectations related to art process and product. Each chapter begins with a classroom vignette that describes the challenge, followed by solutions grounded in research and illustrated through practical examples. Each chapter includes full color pictures and photos and ends with an activity or investigation for reflection.